First conquered by Julius Caesar in the 1st-century BCE, Alsace was a prized tract for agriculture in the Roman province of Prima Germania for 600 years—before becoming part of a Frankish Duchy in 496 CE. 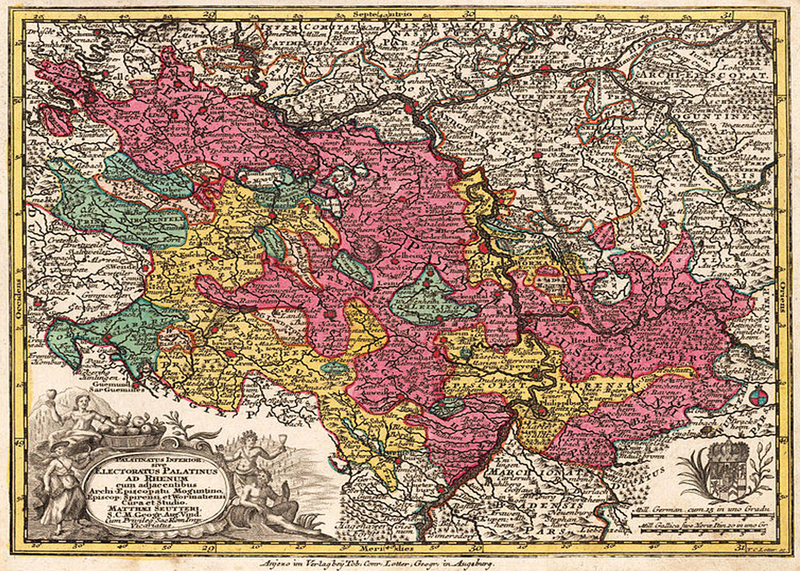 After an extended period as a buffering borderland in the Holy Roman Empire, it was annexed by French troops in the late 17th-century as a territorial spoil of the 30 Years War. For the next 350 years, the strip traded Germanic and Franco occupation before settling as a hybridized people and culture within modern-day France–and so it also is with their fashioning of wine. The Alsace AOC (Appellation d’Origine Contrôlées) was established in 1962, and its relatively stringent winemaking guidelines reflect the pride and ambition by Alsatians to codify their vinicultural expertise. Anchoring the northeast corner of France, this is the largest of 3 related appellations; representing 75% of the region’s vintners. Their output of varietal whites such as Riesling, Gewürztraminer, Pinot Gris, Pinot Blanc, and this week’s DéClassé featured Sylvaner, are widely regarded as more fulsome versions of the sometimes, too-lightweight counterparts produced elsewhere. 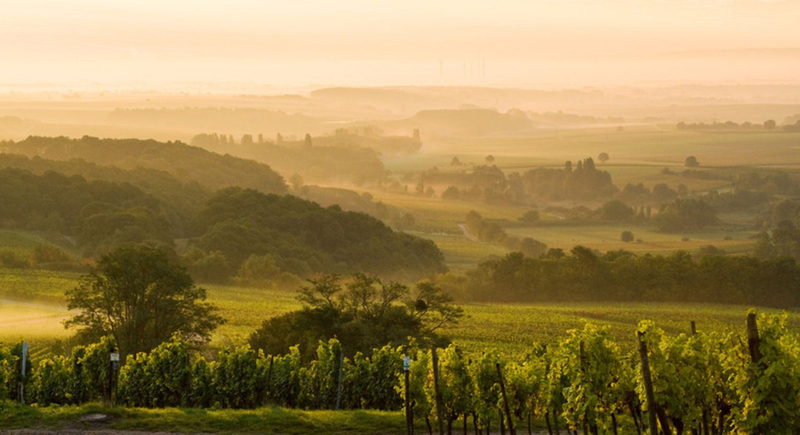 In prudently embracing high AOC standards, particularly the preference for quality over quantity, Alsatian vintners are guarding the regional character that’s taken centuries to forge. Arguably, they remain in a leadership role for the cultivation and refinement of cool climate wines; just ahead of the burgeoning competition, across the border in Germany! 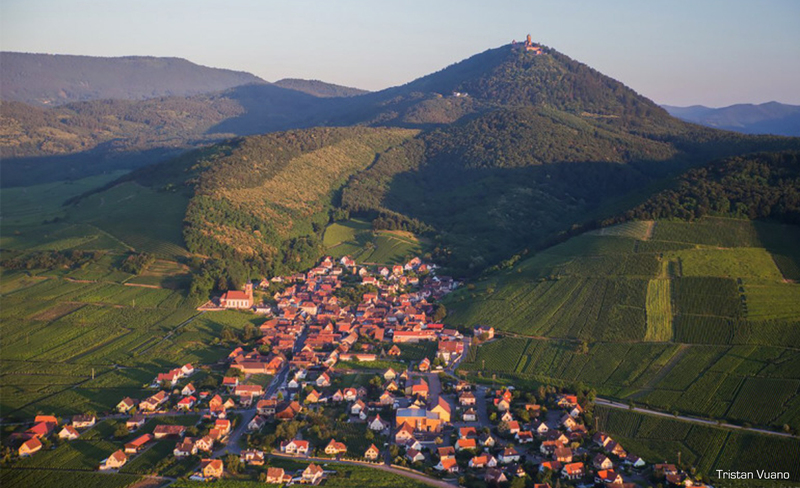 10 generations into their dual inheritance of winemaking traditions, the Allimant and Laugner families have long-lived roots around the village of Orschwiller—set against the picturesque foothills of the Vosges mountains. Since the early 18th-century, the combined estate of 20 hectares has been producing many of the varietal wines listed above. 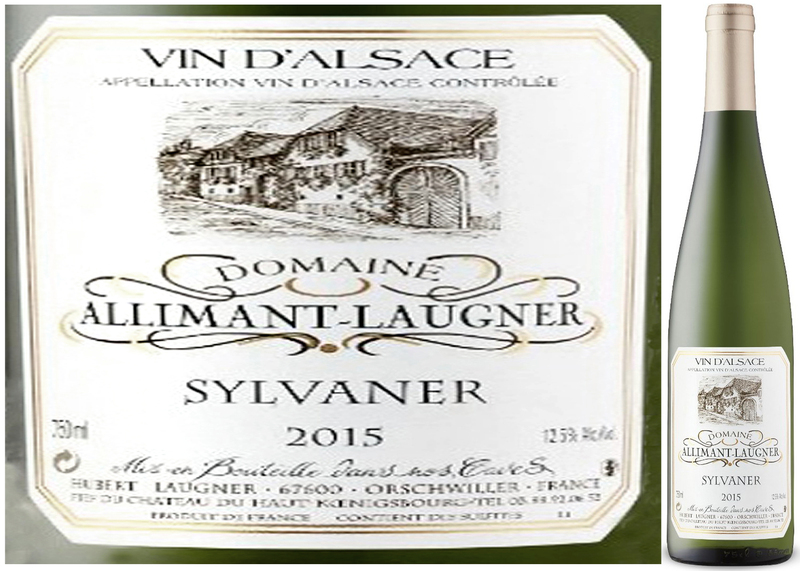 Sylvaner, though, largely remains a mystery to many North American consumers due to its limited production volumes and export—making for an unusual opportunity to get acquainted with the subtle and beguiling charm of Domaine Allimant-Laugner Sylvaner, 2015. If your white wine tastes fall somewhere in the midst of Chenin Blanc, Sauvignon Blanc, Soave and Pecorino, then this offering will assume a satisfying place as an alternate choice. Though offering little in the way of aromas, the citrus, pear and delicately herbed character of its flavours more than make up for the deficit. Dry, crisp and cooling, this ranks highly as an easy-drinking, warm-weather wine that will add sophistication to patio fare such as arugula salad with grilled chicken, vegetable pastries, poached trout, shellfish, and Pasta Primavera. With nearly a millennia of colourful and sometimes tumultuous history, the story arc of the Palatinate is rooted in the medieval period of the Holy Roman Empire. This fertile strip of land, barely 15km wide by 85 long, would eventually be a coveted set piece in the territorial positioning between far-off Papal Emperors and the emerging Protestants. In a middle ground, the line of secular princes anointed as Counts of Palatine pursued a separate agenda of regional ambition. Centuries of struggle eventually culminated in the 17th century during a so-called War of the Grand Alliance when French troops were dispatched northward by Louis XIV, driving out much of the local population. Emigrating as a group, they would become known in America as the Pennsylvania Dutch, though were mostly German. 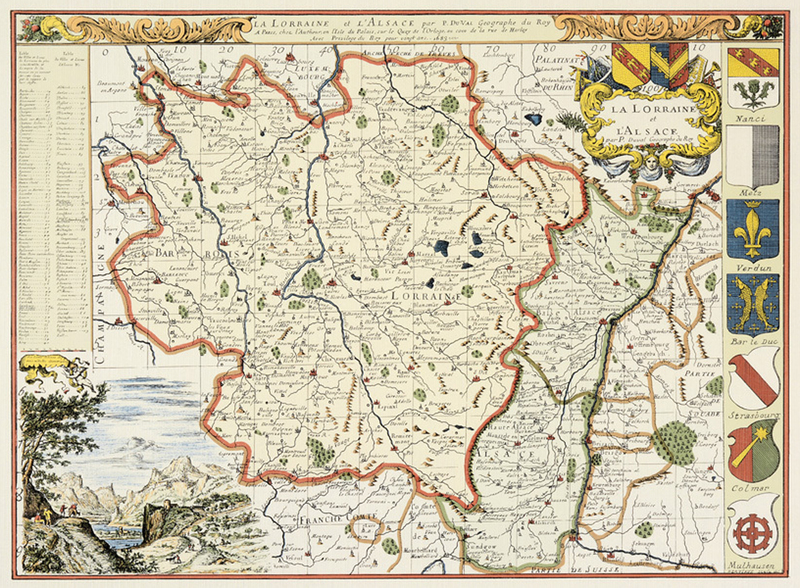 The lands they left are Rheinland-Pfalz: a modern state within the German Federation whose bountiful grape-growing zones are bounded by the west bank of the Rhine River and the densely forested Haardt Mountains. The sheltered, relatively warm and dry microclimate in southwest Germany has helped Pfalz to earn an affectionate nickname as the ‘Tuscany of Germany.’ Several steps along in the region’s agricultural practice and shifting climate, they’re able to cultivate white asparagus, fig, almond, kiwifruit and lemons! The comparison with Italy diverges, though, when it comes to the differing grape varieties that flourish in these respective regions. In Pfalz, along with the success of classic white wines such as Grauburgunder (Pinot Gris), Sylvaner, Gewürztraminer, Riesling, and Weißburgunder (Pinot Blanc), Spätburgunder (Pinot Noir) has attained an equal stature in being the most widely consumed, locally produced red wine. Spätburgunder’s name references both its late ripening nature (Spät) and a 14th-century origin in France’s Burgundy region. Curiously, in the context of such a lengthy period of widespread cultivation in Germanic vineyards, it remains surprising to many North American fans of the wine style that Germany is the wine world’s third largest producer of Pinot Noir by volume. In large part, the relative lack of international exposure is due to many of the small Weinhäuser (wine houses) having neither the individual marketing resources or inclination to develop an export outlet for their offerings – given the already robust, domestic market demand. Nonetheless, small as they may be, you will find many of these family-run wineries linked by the famed Deutsche Weinstraße (German wine road). A visit to this scenic route begins at the French border in the southern district of Schweigen-Rechtenbach and ends 85km later at Bockenheim in the north. While underway, you should include a stop at Weinhaus Eugen Altschuh. 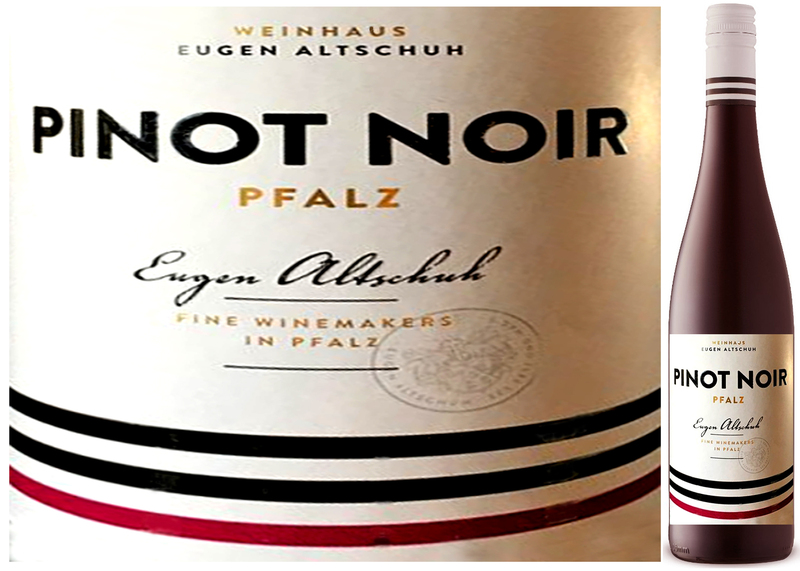 For the less-fortunate wine lovers who won’t be in the Pfalz region anytime soon, the alternative is a trip to the Vintages section of the LCBO where you might cart off at least 3 bottles of Eugen Altschuh Pinot Noir 2015 at the modest price-point of $15.95 — and host a mini German wine festival! As a lighter-weight expression of the German Pinot Noir style, this entry-level bottling features the still-fresh, brambly fruit aromas and flavours of blackberries, strawberry and plum. With bright streaks of acidity, this is an appropriate choice as warm-weather red wine and so could be served very slightly chilled. Try with patio lunch fare such as cold smoked ham or roast beef with a warm, dilled potato salad. As a complement to traditional German dinner fare, serve with a roasted Goose or a herbed Capon with bread dumplings and wine-braised red cabbage tinged with nutmeg.